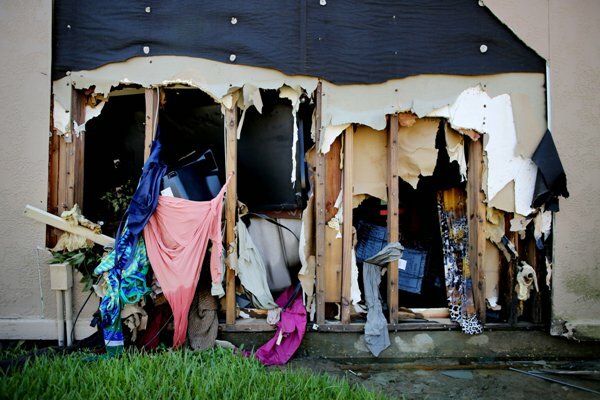 Rescuers began a block-by-block search of tens of thousands of Houston homes Thursday, pounding on doors and shouting as they looked for anyone — alive or dead — who might have been left behind in Harvey’s fetid floodwaters, which have now heavily damaged more than 37,000 homes and destroyed nearly 7,000 statewide. More than 200 firefighters, police officers and members of an urban search-and-rescue team fanned out across the Meyerland neighborhood for survivors or bodies. They yelled “fire department!” as they pounded with closed fists on doors, peered through windows and checked with neighbors. The streets were dry but heaped with soggy furniture, carpet and wood. The confirmed death toll stood at 31, though it is expected to rise. But by midday, the temporary command center in a J.C. Penney parking lot had received no reports of more bodies from the searches, which are expected to take up to two weeks. Unlike during Hurricane Katrina’s aftermath in New Orleans, crews used GPS devices to log the homes they checked rather than spray painting neon X’s on the homes, which also avoided alerting potential thieves to vacant homes. FEMA later backed away from that statement, saying that Administrator Brock Long spoke out of an abundance of caution. An Environmental Protection Agency analysis of the smoke showed that it posed no immediate threat to public health, the agency said. The French operator of the plant warned that up to eight more chemical containers could burn and explode as chemicals stored there degraded without refrigeration. The latest statewide damage surveys revealed the staggering extent of the destruction. 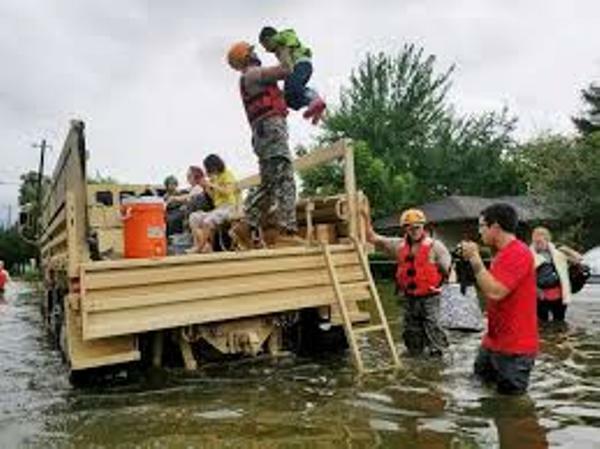 The figures from the Texas Department of Public Safety did not include the tens of thousands of homes with minor damage. Rescues continued, as did the search for shelter among people made homeless by the storm. Emergency officials reported 32,000 people in shelters across Texas. The Harris County FEMA director said the agency was looking at how to house people who have lost their homes to Harvey. The priority is to get them out of shelters and into some form of temporary housing, with hotels being one option, he said. As the water receded in the nation’s fourth-largest city, the threat of major damage from the storm shifted to a region near the Texas-Louisiana state line. Beaumont, Texas, with a population of nearly 120,000, struggled with rising water. The city lost water service after its main pump station was overwhelmed by the swollen Neches River. That forced Baptist Beaumont Hospital to move patients to other facilities. A steady stream of ambulances and helicopters arrived at the hospital to pick up the patients, some of whom already had been removed from flooded nursing homes. Hospital spokeswoman Mary Poole said other patients were able to be discharged. The city’s second hospital, Christus St. Elizabeth, said it was using stored water and accepting only critical and emergency patients. Some people who had not gotten the word were still arriving Thursday seeking medical attention, including J.D. Clark, who said he had a heart condition. He wanted medicine and water but was turned away. Clark said the landlord had turned off the power at his apartment complex. That’s a challenge, though, because most of the highways out of the city are flooded. Macroeconomic Advisers, a forecasting firm, calculates that economic damage could shave between 0.3 and 1.2 percentage points off the nation’s economic growth in the July-September quarter. The economy had been expected to grow at an annual rate of about 3 percent from July through September. Also Thursday, Energy Secretary Rick Perry said he would release 500,000 barrels of crude oil from an emergency stockpile in a bid to prevent gasoline prices from spiking in the wake of disruptions caused by Harvey. As the floodwaters dropped, Houston public schools pushed back the start of classes by two weeks because of Harvey. The nation’s seventh-largest school district had been scheduled to open Monday, but classes will now resume Sept. 11. Although it has been downgraded to a tropical depression, Harvey was still expected to dump heavy rain on parts of Louisiana, Tennessee and Kentucky through Friday. Forecast totals ranged from 4 to 8 inches (10 to 20 centimeters), with some places possibly getting up to a foot. For much of the Houston area, the rain had passed. But with temperatures likely to climb in to the low 90s over the weekend, residents were warned about the dangers of heat exhaustion, especially for people who lost power or must toil outdoors. Houston’s two major airports were slowly resuming full service. Limited bus and light rail service had also been restored, as well as trash pickup. With rivers still rising, and emergency workers still rescuing soaked and frightened people in southeast Texas who have lost nearly all they own, officials counseled patience on Tuesday, warning that conditions for many residents will not improve any time soon. The slow-moving, record-shattering Harvey, now a tropical storm, pummeled the Houston region for a sixth straight day and began to batter southwest Louisiana. With hundreds of thousands of people under evacuation orders, shelters filled to bursting with people who craved some news about the safety of their loved ones and the state of their homes. For now, the city’s focus “will continue to be on rescue,” and not on damage assessment — much less recovery — Mayor Sylvester Turner said at a news conference. The National Weather Service said Tuesday that Harvey has now set a record for total rainfall from a single tropical cyclone in the continental United States, with two weather stations in Texas reporting total rainfall over 48 inches. President Trump is visiting Texas, having arrived in Corpus Christi before traveling to Austin, the state capital. More rain is expected through Friday. 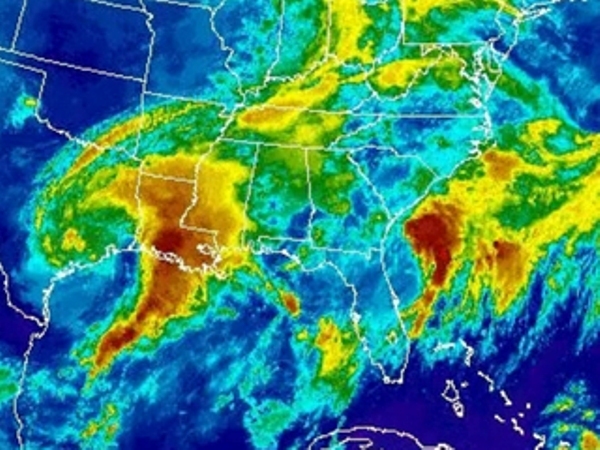 Parts of Houston have already been inundated by more than 40 inches, and totals could exceed 50 inches there and 20 inches in southern Louisiana. With sustained winds near 45 miles per hour, the storm is not expected to weaken until its center moves further inland early Wednesday. As for the record rainfall, a station at Clear Creek, near Interstate 45 southeast of Houston, measured 48.64 inches of rain since Harvey began, and one at Mary’s Creek in Pearland, a suburb, recorded 49.32 inches. The amount of 48.00 inches was recorded in Medina, Tex., during Amelia, a tropical storm in 1978. 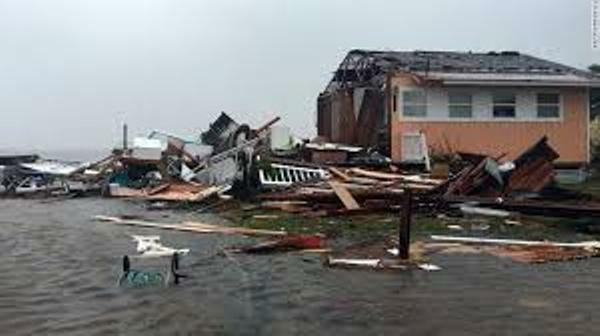 Weather service officials noted that storm is not over and that those numbers may soon surpass the overall United States record for total rainfall from a single cyclone. In Hawaii during Hurricane Hiki in 1950, 52.00 inches of rain were recorded at a ranger station on Kauai. How much rain is that where you live? Check your city or zipcode, via The Upshot. Mr. Trump arrived in Corpus Christi on Tuesday for a briefing on relief efforts, and then headed to Austin for a tour of an emergency operations center and a briefing with state leaders. “It’s a real team, and we want to do it better than ever before,” Mr. Trump said of the response effort during a meeting with officials from local, state and federal agencies in a Corpus Christi firehouse. “We want to be looked at in five years, in 10 years from now as, this is the way to do it.” Read more about his visit here. A Houston officer died trying to get to work. Officials confirmed on Tuesday afternoon that Sgt. Steve Perez, of the Houston Police Department, died in floodwaters Sunday on his way to work. “Unfortunately, in the darkness, Sergeant Perez drove onto an underpass,” Chief Acevedo said. Long lines formed outside Houston’s main shelter. In the early afternoon on Tuesday, scores of people waited under occasional raindrops, hoping to enter the George R. Brown Convention Center, where more than 9,000 people had been taken in. A pile of wet American Red Cross blankets sat near the end of one line, where most people waited quietly. On Sunday and Monday, evacuees had been able to enter the sprawling complex with few, if any, delays. The convention center was far thicker with people on Tuesday and, it appeared, more organized. But there were some signs that the shelter was growing more strained. Some people set up bedding in the main corridor — an area that had been mostly empty a day earlier — and said they had moved from the increasingly crowded main dormitory. But Cora Watson, 58, feared that the convention center would be overwhelmed. “Move them to hotels or something,” she said, her voice barely audible. A levee breach threatens a village near Houston. A levee designed to protect the community of Columbia Lakes, 40 miles southwest of Houston, from the Brazos River was breached Tuesday morning, Brazoria County officials said. Columbia Lakes is a small resort village with a country club and golf course, and is surrounded by levees. Residents were ordered to “GET OUT NOW! !” according to a Twitter message, although many had already left after a mandatory evacuation order was issued Sunday. Tom MacNeil, an owner of a real estate brokerage in the town, said that residents who were still there told him the breach occurred in a levee alongside a creek that flows into the Brazos. Because the Brazos is rising, the creek backed up and poured through two low spots on the levee. The residents shored up the low spots and there was no water in the streets, Mr. MacNeil said. But the National Weather Service has forecast that the Brazos, currently just above flood stage at 30 feet, will rise another few feet by Wednesday and go over the levees, which are at 32 feet. “That’s the scary part we’re watching for,” Mr. MacNeil said. Reservoirs are reaching their capacity in Houston, too. Water rose to the top of an emergency spillway at a major flood-control reservoir west of downtown Houston on Tuesday morning, threatening to add to flooding in the area. Levels at the Addicks reservoir dam read slightly more than 108 feet, the height at which water should overtop the spillway at the dam’s northern end. But officials said observers had so far seen no sign of water going over the structure. “We do expect it to happen,” said Mike Sterling, lead water manager for Army Corp of Engineers’ Southwest Division. Efforts to release water through the dam’s gates have not kept the reservoir level from rising. Mr. Sterling said that most of the overflow should enter drainage ditches and eventually flow into Buffalo Bayou, which passes through downtown Houston. But rising water is putting several neighborhoods north of the reservoir, including Twin Lakes, Eldridge Park and Tanner Heights, at risk of more flooding. Levels at another nearby reservoir, Barker, are increasing as well and its spillway may overtop soon, Corps officials say. And in a cruel paradox, the city also has to worry about having enough water. Houston’s Northeast Water Purification Plant, one of three plants that supply water to the city, is flooded. While the system is still working, even with much of its equipment underwater, city officials are worried about their ability to keep it running. Hurricane Harvey continues to cause widespread flooding and damages across Southeast Texas and Louisiana, and before the system has a chance to move on, two more tropical systems are brewing. Harvey was able to rapidly intensify into a Category 4 hurricane because it moved across exceptionally warm waters and experienced no wind shear. 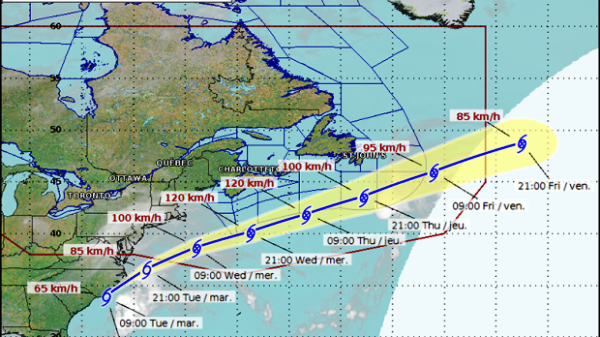 The storm system on the East Coast has more of an uphill battle. The warmer waters are there, but there’s a lot of shear, which could rip the storm apart before it has a chance to form. Current forecast models give the storm about a 50-50 chance to become Tropical Storm Irma. Whether it forms or not, North Carolina are still under tropical storm warnings and can expect heavy rain and gusty winds. 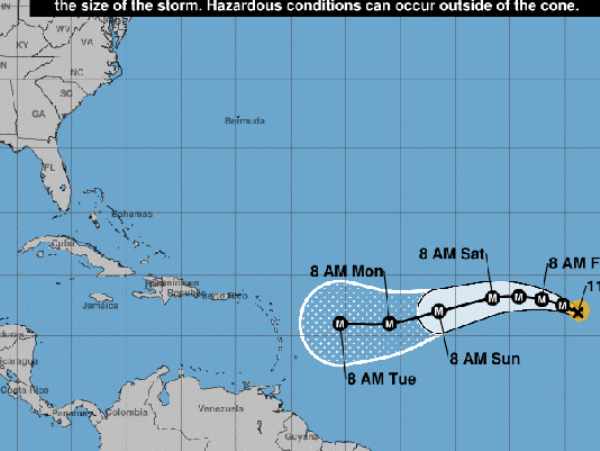 Another system, currently referred to as Invest 93L, is just off the coast of Africa, and that storm could become Tropical Storm Jose before the end of the week. Invest 93L has become better organized in the past day or so, and it keeps growing and intensifying as it moves across the Atlantic. 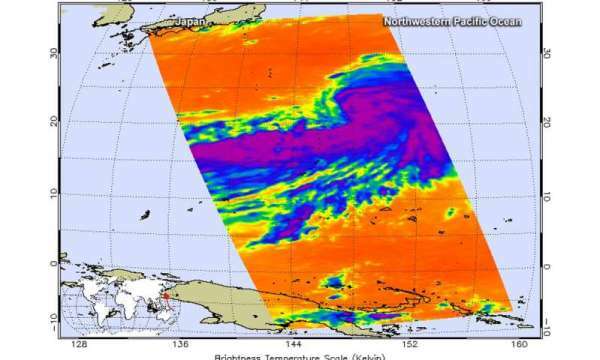 Tropical Depression Sanvu has strengthened into a tropical storm in the Northwestern Pacific Ocean and NASA’s Aqua satellite gathered temperature data on the storm’s cloud tops using infrared light. The Atmospheric Infrared or AIRS instrument aboard NASA’s Aqua satellite captured infrared data on Tropical Storm Sanvu Aug. 29 at 0335 UTC (Aug. 28 at 11:35 p.m. EDT). Infrared data provides temperature information to scientists. Cloud top temperatures are an important factor when it comes to determining the strength of storms. The higher the cloud tops, the colder and the stronger the storms. The image showed that the area of coldest cloud tops had expanded since the previous day. Coldest temperatures were as cold as or colder than minus 63 degrees Fahrenheit (minus 53 degrees Celsius). Those storms were around the center of circulation and in a thick feeder band of thunderstorms extending southwest of the center. NASA research has shown that storms with cloud tops that cold, reached high into the troposphere and had the ability to generate heavy rain. The image did reveal that the tropical storm was being affected by southwesterly vertical wind shear as clouds are being pushed northeast of the center. At 11 a.m. EDT (1500 UTC) on Aug. 28 the center of Sanvu was located near 24.4 degrees north latitude and 146.5 degrees east longitude. That puts Sanvu’s center about 315 nautical miles east of Iwo To Island, Japan. Maximum sustained winds were near 45 knots (51.7 mph/83.3 kph). Sanvu was moving to the north-northwest at 15 knots (17.2 mph/27.7 kph). The Joint Typhoon Warning Center expects Sanvu to move in a northeasterly direction and intensify to typhoon status by Aug. 31, before weakening again.